GigTricks’ goal is to provide a secure, trusting marketplace for gig-economy businesses, clients, and freelancers. Their view is that the current marketplace has non-existent to lax standards which are holding back the ability of the economy as a whole to flourish. 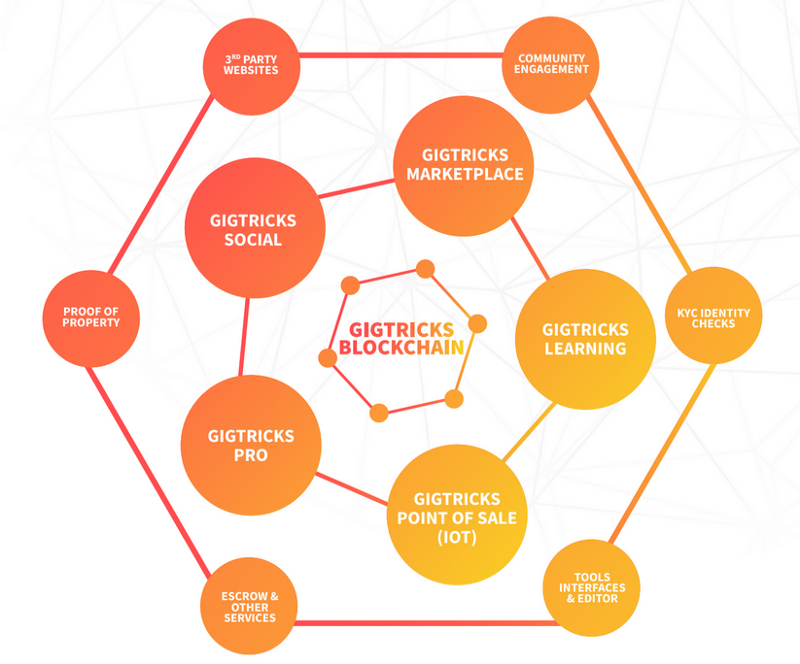 GigTricks intends to build a market ecosystem based on blockchain to increase transparency and reliability for both the clients and the freelancers. The concept of GigTricks is that the current review and rating systems are faulty, at best, and include a very high amount of fraud and cruft. GigTricks would use blockchain to verify all actions within the ecosystem, allowing for complete transparency and trustworthiness. The goal, then, is to allow for the on-demand and gig economy to expand significantly, built on trust and openness, and work against global recession and negative employment trends worldwide. The GigTricks ecosystem is build of various components, Marketplace, Pro, Social, Learning and POS, with different goals for each. POS or Point of Sale allows freelancers to conduct business, taking payments and invoicing online. Pro allows for skilled freelancers to showcase verified profiles for review by clients. Marketplace allows for clients to search for, review, and select freelancers for a variety of jobs based on credentials that have been authenticated and confirmed. Social allows users to earn tokens based on social content creation and consumption, those tokens can then be used to pay for other features within the ecosystem. Learning allows for skill improvement of freelancers through various teaching methods. The GigTricks economy is designed to reduce unnecessary communication and friction in the client-freelancer interaction by providing as much information up front as possible and verifying it beforehand. Additionally, GigTricks has a implemented a voting system to help resolve disputes. GigTricks is positioning itself as the center of this re-structured gig economy. Launch the GigTricks Marketplace based on USD to start acquisition of customers and to encourage new users to trade on the marketplace. Phase in the entire remaining GigTricks blockchain based ecosystem. Phase one is complete as of December 2017 and user acquisition is growing. GigTricks estimates a greater-than-1.4 trillion dollar global market for freelance and on-demand work, with North America containing more than half of the total freelancers. Additionally, in the US, the freelancer market is growing much faster than the general workforce. Were the current growth rate to continue, there would be more freelancers than not by 2027. GigTricks is investing in the view that this large and growing economy will require massive changes to how work is done, but more importantly, how work is sourced. The current methodologies have many failure points, leading to a loss of value for both clients and freelancers. Unscrupulous clients can simply refuse payment, and legal recourse is often not worth the time or effort to the freelancer. The reverse, where unethical freelancers fail to deliver, or demand extra fees for delivery of product, can not only damage a client’s business, but sour the client on the concept, altogether. If this ad-hoc system can be replaced by one purpose-designed for the task, this should stimulate the gig economy and allow for clients to invest more heavily in this workforce, leading to benefits for both the clients (easier hiring, more consistent work, lower overhead) and freelancers (less overhead, more clients, quicker payment). One interesting aspect of the gig economy is the impact on small and growing businesses. These business can afford to expand their services offered much more quickly when they are engaged in the gig-economy, as they can hire very skilled, entrepreneurially minded freelancers on a project-by-project basis without the extreme costs involved in hiring a full time resource. This also helps with businesses located in areas with a low volume of highly-skilled workers, as remote work is expected and paying for relocation expenses can be avoided. Tokens will begin to be sold on April 15, 2008 and continue through August 30, 2018 in 3 phases. During the ITO sales period, the tokens will be available at $0.24800 per token. Private Sale and Pre-ITO sales are capped at 75% of the total tokens offered which comes to 262,500,000 tokens available during those two phases. 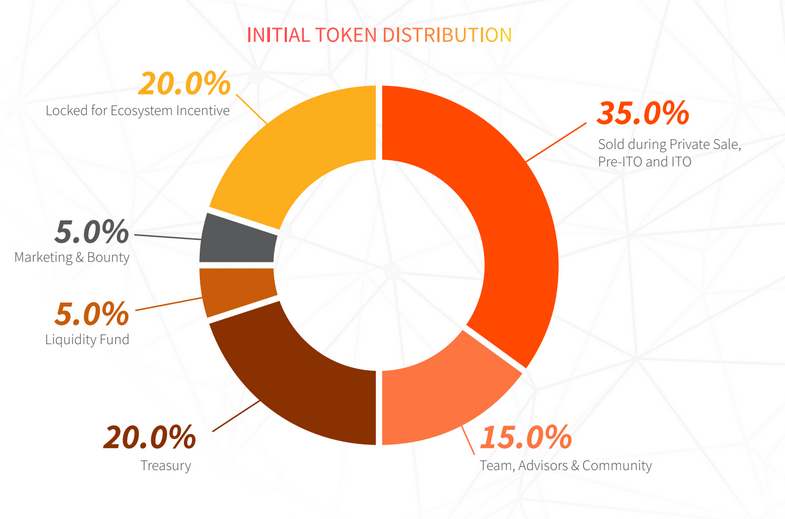 The graph below shows the distribution of tokens, with 35% being sold and the remainder going to the team, treasury, liquidity fund, marketing, and the ecosystem initiative fund. There is a soft cap of $5 million and if this is not reached, all funds will be refunded. All purchase requests are handled in chronological ‘first-come first-served’ method, so it will be important to move quickly after a decision has been made. If you’re looking to invest in Gigtricks’ ITO, you’ll need to register at the website: https://www.gigtricks.io and follow the process there. GigTricks has a very ambitious vision, but are working in a market ripe for disruption and reinvention, that has a very large amount of available profit. They appear to have a solid understanding of the risks and concerns inherent in the market that they’ll be operating in. This appears to be a good way to get in on what could be a truly groundbreaking reinvention of the gig economy. Of course, any prospective investor should do their own research, but GigTricks appears to have a well thought out product, roadmap and investment strategy. The success of GigTricks could have extremely wide ranging impacts on freelancers and clients the world around, allowing for a truly global, open, trustworthy market for freelance and on-demand work that just doesn’t exist at the moment.